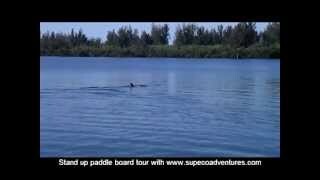 Welcome to Stand Up Paddle Boarding (SUP) Eco Adventures. SUP is one of the fasting growing sports in the world and is a cross between a kayak and a surfboard. Our tours are ideal for the entire family and take you gliding through the secluded tranquil Indian River Lagoon mangroves where you can explore and enjoy the natural wildlife of Brevard County. Manatees, dolphins, turtles, stingrays, osprey, pelicans, countless fish and many other birds and animals call this area home.